Good Morning my beauties!!! Today is a very good day because I am going to share with you the secret to long, gorgeous, and healthy hair! I have always dreamed of having that gorgeous Victoria Secret model hair that I think we all at one point dreamed of having. Those gorgeous long waves and volume is exactly what I wanted. My hair is the complete opposite of that especially the fact that its is thin and frizzy does not help with getting to my goal of model hair. I have tried everything from biotin supplements to every shampoo out there to grow my hair out. Maybe you can relate but I always felt that my hair would grow to a certain length and not go past it. 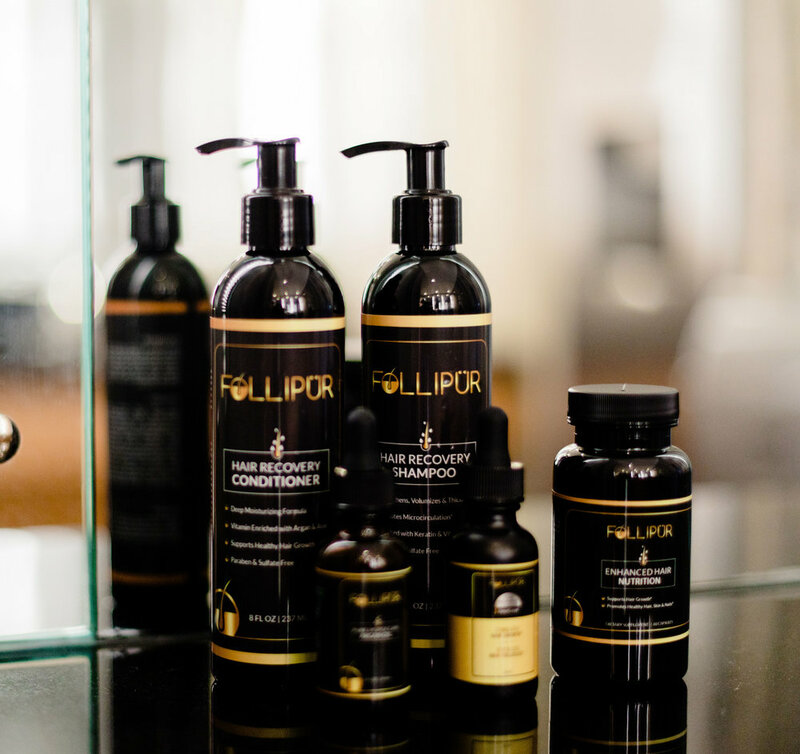 So when Follipur approached me to try their 4 Steps To Complete Hair Revitalization I want all in! I mean it couldn’t hurt to try something that can possible get me to gorgeous hair goals, right? For the past 2 months and 1/2 I have been using the 4 step system and been loving it!! My all time favorite product is their is their Step 1 Follipur Hair Regrowth Treatment with the ingredient AnaGain. I had noticed months ago that on the sides of my scalp my hair was starting to thin out because of my breakouts with dermatitis. I started to put the treatment on the sides of my scalp and noticed a huge difference. Reason why is all because of AnaGain. Below is exactly what AnaGain does. The active ingredient in Follipur Hair Regrowth Treatement is AnaGain. AnaGain is a revolutionary new over the counter solution for hair loss. AnaGain can reactivate hair growth by moving it from its resting phase (known as Telogen) and stimulating the growth phase (known as Anagen). AnaGain is completely organic and is proven to work for both women and men. If you are suffering from hair that is thinning or balding Follipur can reverse and even fix hair loss. Most hair growth products can take up to 12 months to start showing results... but Follipur accelerates the process dramatically. Follipur Hair Regrowth Treatement is formulated to not only stimulate hair growth from the root but also protect to prolong your hairs life cycle and restore its natural glow. Reverses the signs of hair loss. Stimulates new hair growth at the root. Prolongs and restores your hairs life cycle and vitality. Helps to strengthen hair and minimize breakage. The 4 step system is amazing! It is all about healing, fueling, renewing, and shielding. The Shampoo and Conditioner is another favorite of mine. The aloe juice helps to soothe my sensitive scalp which I love! By combining the power of Keratin, Argan, Biotin and Aloe, this ultra-repairing and moisturizing formula delicately volumizes and re-enforces for healthy scalp and hair. Also helps to grow your hair from within with their supplements called the Advanced Hair Nutrition. Follipur Enhanced Hair Nutrition lets your body optimize it's natural keratin production and work wonders on your hair. You also get Natural Moroccan Argan Oil! You can fight off preliminary to advanced signs of damaged or weakened hair. Making it a powerful combination for rapid follicle recovery. Complete solution for attacking hair loss as well as revitalizing your hairs nartual volume and shine. The Regrowth Treatment with AnaGain is a proven and effective solution to help kick star new hair growth. The Advanced Hair Nutrition formula works to provide your body with the enzymes it needs to naturally increase new hair volume and strength. Follipur Hair Recovery Shampoo & Conditioner bundle gently cleanses your hair eliminating free radicals while fortifying with powerful nutrients. Follipur's Pure Moroccan Argan Oil works to shield and protect your hair from harmful elements and the environment. Highly recommended for people with mild to severe thinning to prevent and even reverse futher deterioration. Using the entire Follipur System is the most powerful way to rebuild and restore hair more efficiently. The combination effect will work wonders on your hair. I know that it can be embarrassing to suffer from hair loss, hair thinking, or weakened hair. As we age it can start to happen to us all and its ok. You don’t need to be embarrassed and take control of it. Find an amazing system like Follipur that can help gain your confidence back. I am so in love with my hair because of Follipur! To all my moms out their I know after having a baby hair loss can start. This is for you and I promise you won’t be disappointed with your results. A lot of systems take about a year to work but Follipur starts to work right away within the first two months. I love fast results so knowing this made me a happy girl!